10 answers you might want to know about a toxic thyroid nodule. Toxic thyroid adenoma results in excessive thyroid hormone production from a single nodule in the thyroid gland. The excess thyroid hormone production can no longer be controlled by the body thereby resulting in hyperthyroidism. 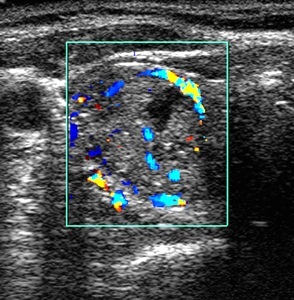 Ultrasound scan in transverse section of the thyroid gland of a 73 year old female patient, showing a hot nodule (increased activity) in one thyroid lobe corresponding to a toxic adenoma. Alternative names for toxic thyroid nodule (adenoma)? What is a toxic thyroid nodule (adenoma)? A toxic thyroid nodule causes hyperthyroidism (an overactive thyroid). This occurs when a single nodule (or lump) grows on the thyroid gland causing it to become enlarged and produce excess thyroid hormones. If the increased hormone production is coming from a single nodule in the gland, this is called toxic adenoma. If there are many nodules causing the hyperthyroidism, this is referred to as toxic multinodular goitre. What causes a toxic thyroid nodule (adenoma)? The thyroid gland needs iodine to produce the thyroid hormones thyroxine and triiodothyronine. If iodine is lacking in the diet, the thyroid initially cannot produce enough thyroid hormones. Low levels of thyroid hormones cause the thyroid gland to grow as it works harder to absorb as much available iodine from the bloodstream as possible in order to make more thyroid hormones. What are the signs and symptoms of a toxic thyroid nodule (adenoma)? Signs are similar to those of hyperthyroidism (warm sweaty palms and tremors), but can also include a prominent thyroid gland with a distinct nodule. How common is a toxic thyroid nodule (adenoma)? Thyroid disorders are much more common in women than in men. Figures from the USA state that the incidence of toxic thyroid nodules accounts for 3-5% of patients with hyperthyroidism. Toxic nodules are more common in elderly people. Are toxic thyroid nodules (adenomas) inherited? 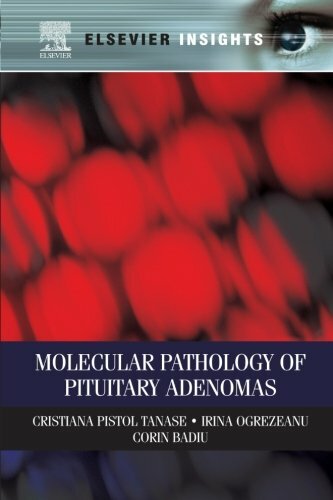 Currently, toxic nodules are not thought to be inherited. However, research is being carried out to look at the possibility of genetic involvement in development of toxic nodules (adenomas). How is a toxic thyroid nodule (adenoma) diagnosed? Diagnosis is very similar to that of hyperthyroidism. A blood test is carried out to measure thyroid hormone levels and a full medical history should be taken. The thyroid gland will be examined for presence of nodule(s). An ultrasound scan of the neck may be carried out to assess the thyroid nodule, and a tissue sample may be taken for analysis. This involves inserting a small thin needle into the nodule to collect a tissue sample which can then be analysed in the laboratory. This procedure is not painful, but can feel uncomfortable. In a small number of cases, if the swelling is large, other tests may be carried out to assess whether breathing is affected. Rarely, a computerised tomography (CT) scan may also be performed to obtain a more detailed image of the gland. A thyroid iodine uptake scan may also be performed. This is a test to measure how much iodine is taken up by the thyroid gland and gives an indication of whether the thyroid gland is under or overactive. In the case of a toxic nodule, you can see one area of increased uptake of iodine, with the rest of the gland suppressed. All these investigations can be performed in the outpatient department. How is a patient with a toxic thyroid nodule (adenoma) treated? Radioiodine is the most effective treatment to cure a toxic nodule (adenoma). It involves the patient taking either a capsule or liquid containing radioactive iodine. This can be carried out in the outpatient department. Iodine is used mostly by the thyroid gland so that all the radioiodine is concentrated in the gland and causes a gradual destruction of it. The iodine does not affect any other part of the body and is a relatively safe treatment. Surgery may be carried out to remove excessive thyroid tissue and nodules, which will treat the hyperthyroidism. If the nodules are large, surgery will treat compressive symptoms of the enlarged thyroid such as breathing and swallowing difficulties. If a total thyroidectomy is carried out (to remove the whole thyroid gland), thyroid hormone replacement will need to be taken for life. Surgery is usually very effective, but a small number of patients develop recurrence of the nodules. Medication: anti-thyroid drugs such as carbimazole are used to control the overactive thyroid symptoms, but these are not a cure, and if stopped, the patient will return to having hyperthyroidism. Carbimazole, which is taken as tablets, is mainly used either before surgery to control symptoms or in patients where other treatment options are not possible. A minority of patients (around 1%) experience a sore feeling or discomfort in the front of the neck following radioiodine treatment. The radioiodine can also cause the thyroid gland to become underactive in some cases. The patient would then need to take tablets for life, to replace the thyroid hormone. It is also important for patients having radioiodine treatment to stay away from children and pregnant women for three weeks to avoid exposing them to radiation. Patients should speak to their doctor about pregnancy as it should be avoided for up to six months after treatment. Patients should discuss any concerns with their doctor. More information on the practicalities of radioiodine treatment can be obtained from the hospital’s Medical Physics department where the treatment will take place. There are general risks of surgery and anaesthesia which should be reviewed by the surgeon or anaesthetist. Further rare side-effects include damage to the recurrent laryngeal nerve which runs close to the thyroid gland in the neck and can affect or alter a patient’s voice if damaged (causing a hoarse voice). The parathyroid glands are attached to the thyroid and can be temporarily or permanently injured during the surgery causing hypoparathyroidism. This would require the patient to take calcium and vitamin D supplements for life. However, in some cases one of the parathyroid glands can be preserved in the body and normal parathyroid function is restored. These should be discussed with the patient before surgery. If the whole thyroid gland is removed, thyroid hormone replacement tablets (thyroxine) will need to be taken for life. Taking carbimazole tablets can cause side effects such as reducing the number of white blood cells in the body; however, this is very rare. Patients who develop a sore throat or raised temperature whilst taking carbimazole should see their doctor as soon as possible. What are the longer-term implications of a toxic thyroid nodule (adenoma)? The long-term implications of a toxic thyroid nodule or adenoma depend on the treatment option used. Patients taking carbimazole tablets will likely need to take them daily for life. Blood tests should be carried out regularly to monitor thyroid hormone levels and to adjust the dose of carbimazole accordingly. The majority of patients are able to find a medication regime that works for them and go on to live full, active lives. If untreated, besides feeling poorly and unwell, the patient is also at risk of heart dysfunction or failure due to the increased heart rate and raised metabolic state. This irregular heart rate can result in strokes and dizziness. Long-standing toxic nodules can also affect the patient’s bones and cause osteoporosis which results in weak bones which are more likely to fracture. The patient may also develop symptoms due to the enlarged thyroid gland such as difficulty with breathing or swallowing (as the enlarged gland may press on the food or wind pipes which are located nearby). If patients have any concerns about this condition, they should discuss them with their doctor or healthcare provider. Questions or anything to add about a toxic thyroid nodule? We want your thoughts in the comments section–Please!